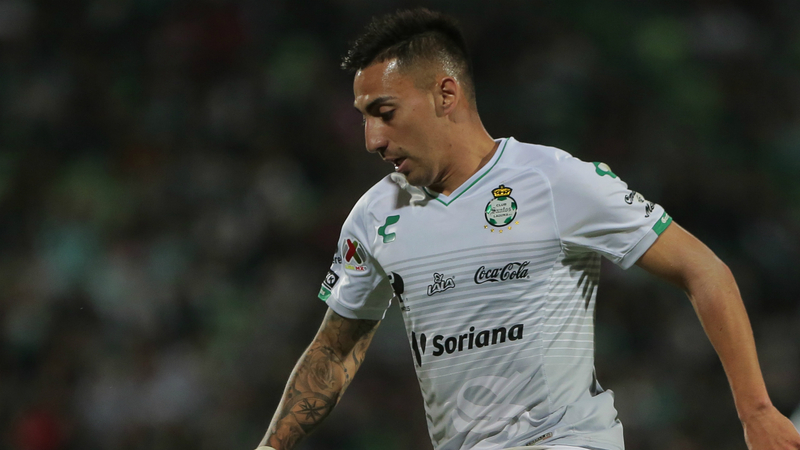 Javier Correa scored a first-half hat-trick as Santos Laguna routed Marathon 6-2 in the opening leg of their CONCACAF Champions League last-16 fixture. Correa netted three goals within 19 minutes before half-time against Honduran hosts Marathon in San Pedro Sula on Wednesday. Doria added a fourth for Santos four minutes into the second half, while quick-fire goals from Marlos Moreno and Julio Furch sealed an emphatic victory for the Mexican side after Marlon Ramirez had pulled a goal back for Marathon. Marathon netted a second consolation goal via Justin Arboleda with 16 minutes remaining as Santos return to Mexico for the second leg on February 27 poised to reach the quarter-finals. ¡Javier Correa de @ClubSantos es el Jugador del Partido #MARvSAN! Meanwhile, last year's semi-finalists New York Red Bulls were comfortable 2-0 winners over Atletico Pantoja in the Dominican Republic. A 39th-minute own goal from Jean Innocent following Bradley Wright-Phillips' strike got the ball rolling for the Red Bulls, who strengthened their grip on the tie following Daniel Royer's strike 23 minutes from time. Elsewhere midweek, Alianza and Monterrey played out a goalless draw in El Salvador.